This morning, I wrote this article to highlight the DFL’s smear campaign has already started. In the article, I quoted Rep. Melissa Hortman as saying something that’s pure projectionism. When asked if Republicans wanted a transportation bill, Rep. Hortman replied “I think this is the problem when you hire the people who drafted your attack literature in the last campaign to run your legislative agenda.” We’ll get to that in a little bit. The opposite is true. The House GOP bonding bill included money to fix one of the most dangerous stretches of highway in Minnesota, a 38-mile stretch of Highway 12. After the House passed their bonding bill by a 91-39 margin, all that was necessary was for the Senate to pass the House bonding bill. Instead, with 8 minutes left in the session, the DFL amended the bill to include funding for the controversial Southwest Light Rail project. 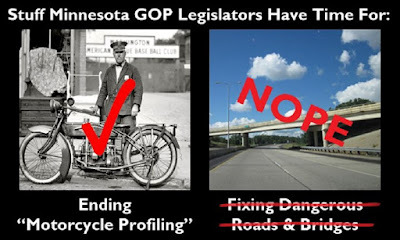 The GOP tried fixing one of Minnesota’s most dangerous highways. 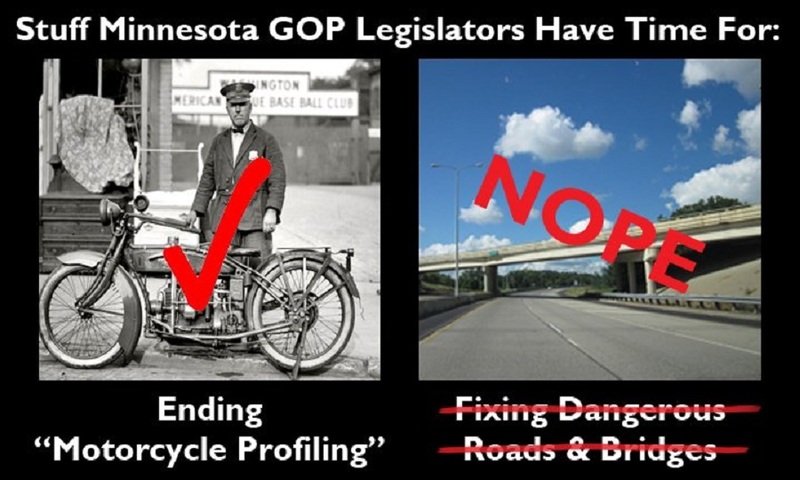 The Senate DFL killed the bill that would’ve fixed one of Minnesota’s most dangerous highways. A member of the House DFL leadership team accused Republicans of hiring “the people who drafted [the GOP’s] attack literature” as staffers. The DFL hired the communications director from a DFL front group that specializes in producing the DFL’s attack literature. It’s sad that the DFL’s campaign is built on the premise that a) Republicans are heartless, b) the DFL only runs high-minded campaigns and c) the DFL wants nothing but the best for Minnesota. The truth is that the DFL is incredibly dishonest. The Times’ latest editorial reads more like DFL chanting points than an editorial that required original thought. Even the commenters noticed the Times’ dishonesty. Rep. Murphy wouldn’t know intelligent public policy if it bit her in the backside. Tax increases on autopilot are terrible policy because it’s multiple tax increases with a single vote. If it’s such a benefit, the ClearWay shouldn’t have any difficulty persuading the legislature into passing their tax increases. At minimum, if the cigarette tax increases are as popular as ClearWay insists, they shouldn’t have trouble defeating legislators that vote against ClearWay’s agenda. Q: I mentioned the R & B flavor to your Gospel music because, as a Christian, I’m impressed with the mix of those styles. How personal are your albums? I’m asking because Hearts of Broken Love sounds very personal. A: My albums are very personal to me because it speaks about Christ. I always want to make sure that I’m faithful to God’s word when I study His word and when I write my songs, I want my songs to glorify God and speak to the heart of His people. Hearts of Broken Love is also personal to me, and I’m glad you asked me that question. Because I named my album that using the Scripture God wrote in Matthew 24:12 “And because inquiry shall abound, the love of many shall wax cold.” The world is very cold and full of darkness. But God’s light shines in the heart of His people because Christ Himself is the light. It’s important to me to share everything faithfully about God’s word, His love, His righteousness and His wrath. I’ve always enjoyed listening to Gospel music because it’s inspirational. Thanks to Ms. Sessions’ unique style, I’m now addicted to Urban Gospel, too. 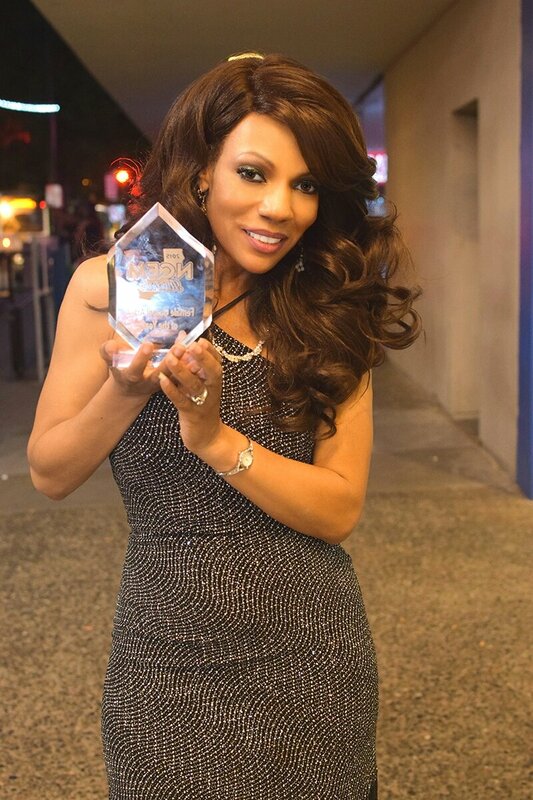 Follow this link to find out more about Ms. Sessions’ music. The combination of her singing voice and the R & B style makes for some thoroughly enjoyable listening. Finally, it’s difficult to believe that Ms. Sessions has been in the music industry for over 20 years. The reason it’s difficult to believe, at least for me, is because Ms. Sessions’ style is fresh and unique. While writing this op-ed for Trumpbart, David Horowitz slipped back into his fascist-progressive habits that he learned from his parents growing up. That’s when Horowitz learned that the fastest way to shut down a debate was to call the other person a racist or a bigot or some other pejorative. In this instance, Horowitz insisted that Bill Kristol’s argument that Trump isn’t equipped for the job is proof of Kristol’s betrayal of America. With that fascist taunt, Horowitz must hope he isn’t challenged. I’ll just say this: dreams die hard. I’m perfectly willing to challenge Horowitz’ thinking, if it can be called that. Frankly, Trump’s understanding of public policy and his utter disrespect for this nation’s laws and our Constitution make him a constitutional crisis waiting to happen. Candidate Trump has repeatedly frozen out media outlets who haven’t praised him sufficiently. When Trump questioned Sen. McCain’s patriotism, the Des Moines Register wrote an editorial calling for Mr. Trump to resign. The next time he was in Iowa, his campaign wouldn’t permit the Des Moines Register’s Katie Obradovich into his event. The Founding Fathers, the greatest collection of political leaders in the history of the world, wrote that free speech was essential to society and that political speech was to be the most protected speech of all. Trump thinks it’s more important for the press to stroke his ego. That trait alone disqualifies him from office. That’s why I’m still #NeverTrump. Some things, like brushing aside the Constitution, aren’t just about politics. It’s about saying political victories aren’t sufficient when a tyrant wants to destroy the things that made America the greatest nation on earth. Is Trump more unprepared than Barack Obama whose qualification for the presidency was a lifetime career as a left-wing agitator? And how did that work out? Despite the lacunae in his executive resume, Obama is now regarded as “one of the most consequential presidents in American history” by reasonably qualified experts. At best, Trump is just as unqualified to be president as President Obama was. Further, saying that President Obama is “one of the most consequential presidents in American history” isn’t praising him. There are lots of despots who’ve been consequential. That doesn’t make we should elect another despot to replace him. What BS. Trump vs. Hillary isn’t “a clash between two parties and constituencies with radically differing views of what this country is and should be about.” They’re opposite sides of the same coin. They both think that the rules don’t apply to them. They both think that they’re entitled to ignore this nation’s laws and our Constitution because they’re entitled. Finally, useful idiots like Laura Ingraham, Charles Hurt and Eric Bolling have been telling us about how America is going through a populist moment. That’s true. They insist that Trump is the right man for the job. They never talk about Trump’s qualifications, though. Their silence is deafening. Mr. Trump’s understanding of policy really is like a 12-year-old’s. Further, I can’t wait to hear Prof. Jaede’s justification for using government resources to talk about a counterprotest put on by a progressive political organization named #unitecloud. If you visit their missions page, it says “Who is your neighbor? If that doesn’t sound like a DFL front group, then DFL front groups don’t exist. And I know DFL front groups exist because I’ve exposed more than a few dozen DFL front groups. I’d love hearing President Potter’s or Prof. Jaede’s justification for using government resources to announce a political protest at a church on the opposite side of town from the University. I’m betting that they’d fumble their way through a justification if I asked them that question without notice. That’s a first: Dayton reads bills? Rachel Stassen-Berger’s article provides a little levity at a critical time. Ms. Stassen-Berger’s article opens by saying “Minnesota Gov. Mark Dayton will spend his holiday weekend reviewing the minute details of the spending and tax bills the Legislature delivered for his signature as he decides their fate.” If that’s true, it will mark the first time in his administration that Gov. Dayton will have paid any attention to the details of any legislation. Right before FarmFest 2013, Gov. Dayton discovered the farm equipment repair sales tax in the Tax Bill he personally negotiated with Sen. Bakk and then-Speaker Thissen. After FarmFest, Gov. Dayton promised to repeal the farm equipment sales tax during a special session of the legislature. Then Gov. Dayton and the DFL legislature broke that promise. In 2012, Gov. Dayton was outraged to find a provision in the Vikings’ stadium bill that gave the Wilfs the authority to charge extra for PSLs, aka Personal Seat Licenses. Like the farm equipment repair sales tax, the Vikings Stadium bill was a bill Gov. Dayton personally negotiated with the legislature. In the interview, the governor said he had already pored over the lawmakers’ work. The Legislature, on wide bipartisan votes, also approved tax cuts and credits that cost the state cash in its short- and long-term budgeting. Students with college debt, veterans, tobacco companies, families and cities are among the beneficiaries. Throughout the session, the DFL’s top priorities were for broadband expansion, raising the gas tax and spending more to reduce racial disparities. They voted for tax relief because voting against it would’ve been political suicide but it wasn’t a priority with the DFL. Likewise, it isn’t a priority with Gov. Dayton. Chester Rorvig’s LTE sounds reasonable. It’s just missing one thing. First, let’s look at Mr. Rorvig’s LTE. Rorvig’s LTE starts with “Legislators of both parties, along with transportation experts, agree that Minnesota needs $600 million per year for 10 years to get the state’s roads and bridges up to par.” That’s the conventional wisdom but I’m always skeptical of CW. It’s been wrong too often for me to think it’s reliable. First, I’ve written many times that the last gas tax increase didn’t provide nearly the money the DFL predicted they’d need to fix Minnesota’s roads and bridges. The whole idea behind Chairman Kelly’s transportation plan was to provide a more reliable revenue stream. I find it hard to believe that not one Republican would agree to the gas tax increase and that not one Democrat would agree to the vehicle repair sales tax diversion. It isn’t that Republicans didn’t see the opportunity. It’s that they knew a gas tax increase is an outdated method of funding road and bridge repairs. Couple that with the fact that the vast majority of Minnesotans don’t want the gas tax increase and you have 2 powerful reasons not to raise the gas tax. After all, the will of the people being governed should be heeded. I know it’s a radical idea but it makes sense. When I wrote this article, I expected to have lots of company covering Rep. Thissen’s abusive behavior. Since the 7 GOP legislators wrote the letter to Rep. Thissen, I’ve done searches to see if anyone had written about Thissen’s disgusting behavior. 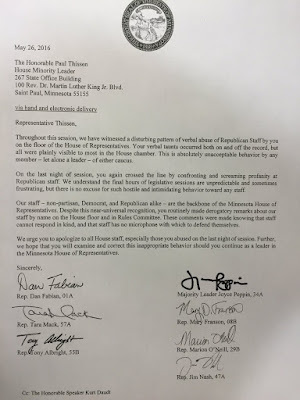 I wrote, too, about how the DFL sat silent while Rep. Thissen repeatedly taunted GOP staffers. Thus far, the silence has been deafening. It’s been telling, too. When 7 legislators say that they’d “witnessed a disturbing pattern of verbal abuse of Republican Staff by [Rep. Thissen] on the floor of the House of Representatives,” that’s a big deal. When Reps. Peppin, Franson, O’Neill, Mack, Albright, Fabian and Nash said that they’d witnessed Thissen’s abusive behavior “throughout this session”, that should’ve gotten reporters’ attention. Apparently, it didn’t get the media’s attention. It’s disgusting that the DFL legislators that Rep. Thissen allegedly leads to sit silent. It’s in their partisan interest to look like they aren’t led by a man who can’t control his temper. It’s one thing to protect a politician in you own party. It’s another to protect a politician when you’re supposed to be a reporter at a major newspaper or TV station. I’m even willing to cut columnists a certain amount of slack. It’s quite another thing when a chief political reporter for KSTP or the Pioneer Press mention the incident in a tweet, then go totally silent on the subject. I get it that the end of session is the biggest story of the week. It’s another thing to just be silent about another big story. And yes, the Thissen story is a big deal. When the DFL senators amended the Bonding bill at the last second, they made sure there wasn’t enough time to pass it in the House. The DFL senators who insisted that the bonding bill include money for the SWLRT did Minnesotans a great disservice. They insisted that they get everything they want and that public safety be damned. Public safety is a core function of government. Light rail projects aren’t. While transportation lobbyists will disagree with me on the latter statement, most Minnesotans will side with me in saying that making Highway 12 safer is an infinitely higher priority than funding the SWLRT project. If a pollster informed people of how dangerous that stretch of Highway 12 is, then asked people whether Highway 12 funding was a higher priority than the Southwest Light Rail project, 95% would pick the Highway 12 project as urgent. When the DFL amended the bonding bill, they knew that they were killing funding for the Highway 12 project, at least temporarily. That’s BS. 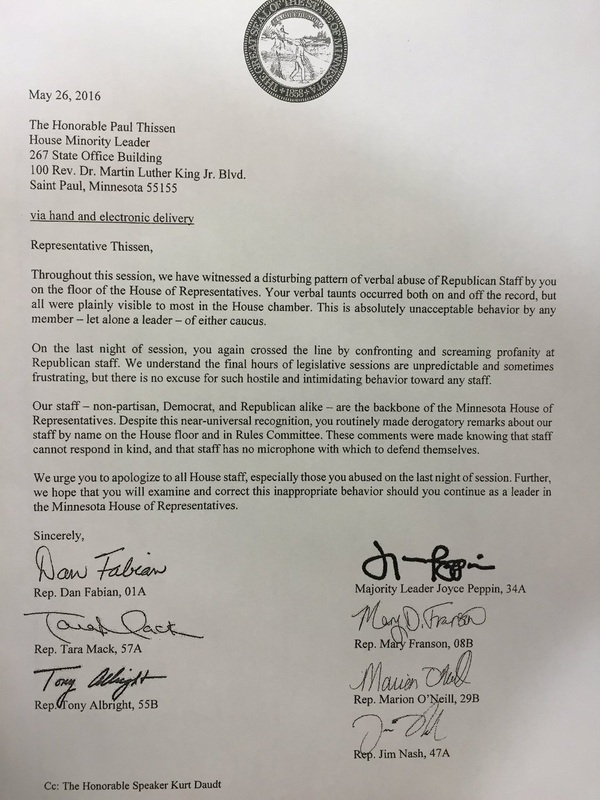 The letter from Reps. Peppin, Franson, O’Neill, Mack, Albright, Fabian and Nash said “Throughout this session, we have witnessed a disturbing pattern of verbal abuse of Republican Staff by you on the floor of the House of Representatives.” Thissen’s behavior wasn’t “over the line.” They weren’t an aberration. They weren’t his reaction in the heat of the moment during the last pressure-packed night of the session. Another thing that stands out is the fact that the DFL watched Rep. Thissen’s abusive behavior and didn’t do a thing to correct Thissen’s behavior. It’s bad enough that Thissen acted like Harry Reid during one of his mindless temper tantrums. It’s worse that the DFL did nothing after witnessing their ‘leader’ abuse defenseless staffers. It isn’t enough for Rep. Thissen to just apologize. That’s required but it isn’t enough. What’s required, too, is for Thissen to resign his post as House DFL Leader. Repeated abusive behavior is proof that he doesn’t respect the people who support legislators. It’s proof that he thinks they’re his servants, not valued support staff that makes the legislature work.